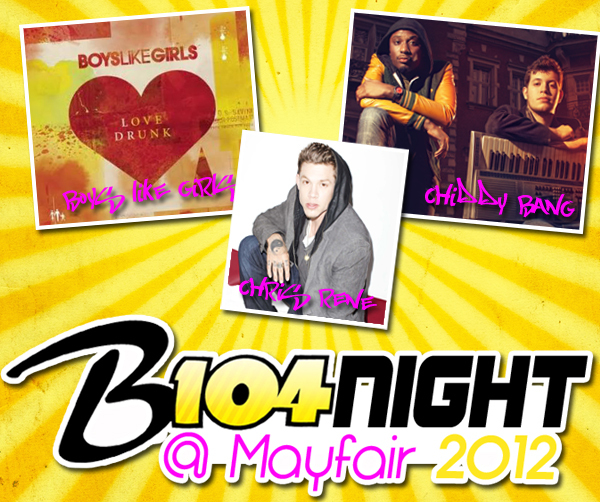 B104 announced today that they’ll be bringing Boys Like Girls, Chiddy Bang, and Chris Rene to B104 night at Mayfair on May 25th. Boys Like Girls, a pop punk from Massachusetts, first rose to the top of the charts with their breakout single The Great Escape. The group went on to release a second studtio album, Love Drunk, in 2009. Chiddy Bang, an indie hip hop group from Philly, played Muhlenberg College with Wale last April. The duo stepped into the spotlight with the release of their first mixtape featuring the song Opposite of Adults which uses a sample from the hit MGMT song Kids. Chiddy Bang recently released their first full-length studio album Breakfast in February. Chris Rene, a former contestant on The X Factor (USA), will open the show. His original song Young Homie, which he sang during his X Factor audition, will be the lead single off of his forthcoming debut album. I’m writing for a friend who wants to meet Chris Rene. I heard it on the radio and didn’t get details on how to sick up for the meet and greet, any information would b greatly appreciated. We’re not directly affiliated with Mayfair in any way, just report on the festival. Your best bet would be to contact the festival organizers directly by giving them a call at 610.437.6900.